A Concordia administrator told a biracial female student that she should overlook her own experiences because incidents of sexual and racial harassment are so common within student associations. Months since her story went public in April, Mei-Ling (a pseudonym to protect her anonymity) says no one from the university has contacted her to offer any form of assistance, despite the fact she’s continuing to study there. “The saddest thing is that people I did tell—and I did tell people around me—totally ignored it,” she said. Still though, during a press conference Monday morning, Mei-Ling expressed optimism that the Arts and Science Federation of Associations (ASFA) can change the “toxic” culture she experienced while serving as vice-president over a year ago, and hopefully lead to greater change within Concordia. Mei-Ling, who is half Chinese and Italian, discovered two students had exchanged private Facebook messages using racial and sexual slurs about her, which contributed to fostering an unsafe environment within ASFA. 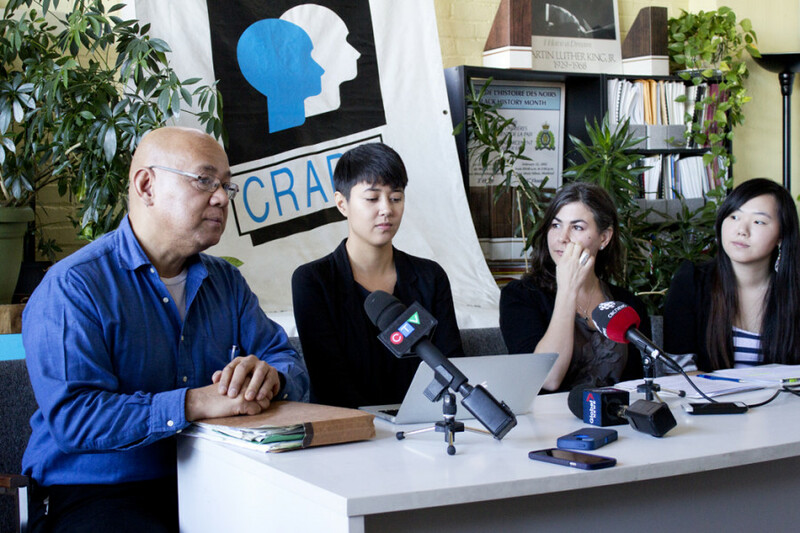 The Centre for Research Action on Race Relations (CRARR) in Montreal, which acts as Mei-Ling’s representative, reached a settlement with ASFA following mediation. ASFA represents approximately 15,000 undergraduate students within the Arts and Science faculty at Concordia. Mei-Ling will receive an undisclosed amount of money from ASFA as compensation for the harassment perpetrated by her former white male colleagues on the 2013-14 executive team, Paul Jerajian and Sean Nolan. The Quebec Human Rights and Youth Rights Commission is currently conducting a separate investigation into the actions of these two men. The case is expected to go to a formal tribunal, according to Fo Niemi, Executive Director of CRARR. The Centre is seeking $10,000 in punitive and moral damages from each of them. Mei-Ling declined to enter mediation with Jerajian and Nolan. In addition to paying damages, ASFA agreed to create a “task force” to address violence and discrimination against women and minorities within Concordia university bodies, and to implement preventative measures. The task force will consist of students and outside experts that reflect the diversity of Concordia’s population. Emphasis will be placed on the inclusion of Aboriginal, racialized, international, disabled, and LGBT women. Sexual violence is intersectional and doesn’t just affect white, abled cisgender women, said Yuan Stevens, a second year McGill Law student who worked on Mei-Ling’s case for the Centre. This task force will be a student-led initiative and its creation is expected within the next 60 days, Niemi says. A slate who campaigned under the slogan “Support Change,” recently won all but one seat on ASFA’s executive team. Mei-Ling says there’s a lot of potential for growth and change under the new leadership. Two of the new executives, Jenna Cocullo and Mariah Gillis, have been the association’s representatives in mediation. ASFA released a formal apology in August, saying they would fully cooperate in mediation. ASFA was invited to attend the press conference, but Cocullo said miscommunication prevented them from going. She further explained the task force will be comprised of five students and four community members. Her plan is to reach out to all universities in Montreal to find students or community members interested in joining. “The reason I ran as president for ASFA was because someone had to step in and take on this task,” Cocullo said. “The reason I ran as president for ASFA was because someone had to step in and take on this task,” — ASFA President Jenna Cocullo said. CRARR was supportive during the whole process, she says. During mediation, she adds she and Gillis had positive discussions with Mei-Ling discussing how the task force will look. The monetary compensation ASFA agreed to pay Mei-Ling will come from the organization’s legal fund, according to Cocullo. This won’t hinder ASFA’s other operations, she says, but more money needs to be transferred to it because it’s currently being used to consult lawyers to restructure their bylaws and policies. After the stories of harassment emerged last semester, the council of ASFA passed a motion to implement sensitivity training for all types of leadership within the organization. Cocullo says a committee has met and decided what type of training they want, such as harm reduction and consent training. The timeline for implementation isn’t known yet, but she says the committee is talking with the Centre for Gender Advocacy to lead the initiative. Cocullo is hopeful that the Concordia representative from the task force can also sit on the committee working to change the university’s sexual assault policies. In late August, Concordia released a report outlining its review and recommendations to the school’s existing policies to handle sexual violence. President Alan Shepard said the university will act on all of the recommendations. Cocullo wants to have dialogue between the two working groups. CRARR recently released a review of Concordia’s report, outlining the positives and flaws. The report made no mention of the Quebec Charter of Human Rights and Freedom. This is important because sexual violence is a civil rights violation, said Brandy deGaia, CRARR’s community organizer. She explained that for Mei-Ling’s situation, they couldn’t pursue criminal charges against the two men, but the psychological harm and harassment they caused warrants a case in civil court. Another issue was the makeup of Concordia’s review committee: they were all white. “We can only see the world through our own lens,” deGaia said. She referenced how, due to cultural differences, foreign students may not feel comfortable openly discussing sexuality at events like sensitivity or consent training. Thus they may not be getting the information they need to report incidents of sexual violence, she continued. Ultimately, they concluded it’s unclear how the report can help survivors like Mei-Ling in the future, deGaia said.